LiDAR – what is it? 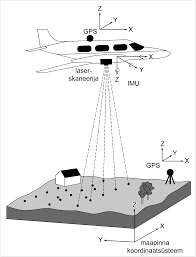 LiDAR stands for “Light Detection and Ranging” and it has become an important tool in the field of archaeology. LiDAR data is very accurate, high resolution 3D data. Captured using special sensors, from the air or the ground, it results in a set of “dots” suspended in a three-dimensional space. These dots can be displayed in special software or converted into a 3D mesh for use in many modern 3D software packages, such as 3D Studio MAX, Maya and Sketchup. LiDAR technology uses light sensors to measure the distance between the sensor and the target object. From an aircraft this includes objects such as the ground, buildings and vegetation. For ground based LiDAR it measures building fronts and street furniture in extreme detail. With the latest technologies it is also possible to obtain colour values of the scanned surface to create an automatically texturered model. LiDAR is ideal when very high accuracy measurements are required and is very cost effective for the amount of data generated. 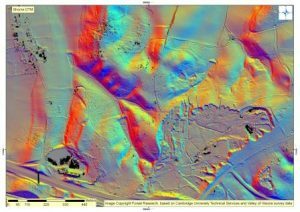 Airborne LiDAR is becoming more and more popular as a source of terrain mapping due to the high levels of detail it provides. Many companies now offer substantial amounts of “off-the-shelf” data as new areas are being flown and added to exisiting archives. 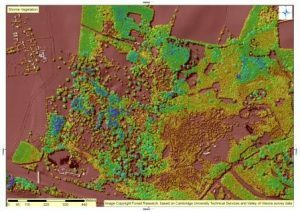 Historic England have produced a page about LiDAR with respect to archaeology – click here to take a look. The UK Environment Agency released their LiDAR data (over 8,000 datasets) in 2015. They launched their portal on Datashare at http://environment.data.gov.uk/ds/survey. where users can access 2m, 1m and 50cm LiDAR composite data for free. This image shows the ‘terrain’ results or DTM. It’s ideal for looking for both the archaeology of woodlands and archaeology in woodlands. This one shows the first return of the laser survey, the ‘surface’ results or DSM, showing the tree cover across the park, which is also great for tree surveys. This entry was posted in News & Events and tagged education, LIDAR. Bookmark the permalink.